Thousands of Indians, Egyptians, Chinese, Filipinos, Turks, Germans, English, Italians, Malaysians, Koreans and a host of other nationalities are lining up at the borders and the airport to leave Libya. It begs the question: What were they doing in Libya in the first place? Unemployment figures, according to the Western media and Al Jazeera, are at 30 percent. If this is so, then why all these foreign workers? For those of us who have lived and worked in Libya, there are many complexities to the current situation that have been completely overlooked by the Western media and “Westoxicated” analysts, who have nothing other than a Eurocentric perspective to draw on. Let us be clear – there is no possibility of understanding what is happening in Libya within a Eurocentric framework. Westerners are incapable of understanding a system unless the system emanates from or is attached in some way to the West. Libya’s system and the battle now taking place on its soil stands completely outside of the Western imagination. News coverage by the BBC, CNN and Al Jazeera has been oversimplified and misleading. An array of anti-Qaddafi spokespersons, most living outside Libya, have been paraded in front of us – each one clearly a counter-revolutionary and less credible than the last. Despite the clear and irrefutable evidence from the beginning of these protests that Muammar Qaddafi had considerable support both inside Libya and internationally, not one pro-Qaddafi voice has been allowed to air. The media and their selected commentators have done their best to manufacture an opinion that Libya is essentially the same as Egypt and Tunisia and that Qaddafi is just another tyrant amassing large sums of money in Swiss bank accounts. But no matter how hard they try, they cannot make Qaddafi into a Mubarak or Libya into Egypt. The first question is: Is the revolt taking place in Libya fueled by a concern over economic issues such as poverty and unemployment as the media would have us believe? Let us examine the facts. Large scale housing construction has taken place right across the country. Every citizen has been given a decent house or apartment to live in rent-free. In Qaddafi’s Green Book it states: “The house is a basic need of both the individual and the family; therefore, it should not be owned by others.” This dictum has now become a reality for the Libyan people. Large scale agricultural projects have been implemented in an effort to “make the desert bloom” and achieve self-sufficiency in food production. Any Libyan who wants to become a farmer is given free use of land, a house, farm equipment, some livestock and seed. 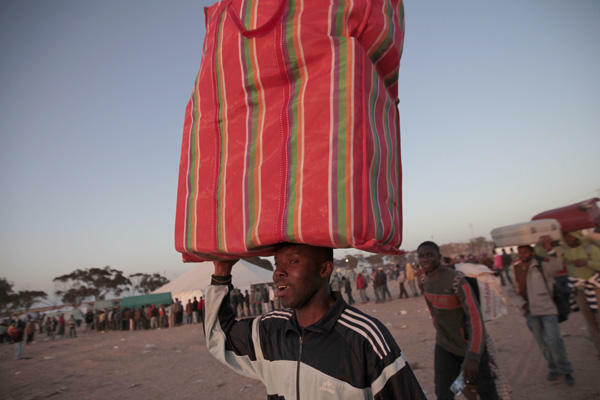 The fact is that the Libyan revolution has achieved such a high standard of living for its people that they import labor from other parts of the world to do the jobs that the unemployed Libyans refuse to do. Libya has been called by many observers inside and out “a nation of shop keepers.” It is part of the Libyan Arab psyche to own your own small business and this type of small scale private enterprise flourishes in Libya. We can draw on many examples of Libyans with young sons who expressed the idea that it would be shameful for the family if these same young men were to seek menial work and instead preferred for them to remain at home supported by the extended family. No system is perfect, and Libya is no exception. 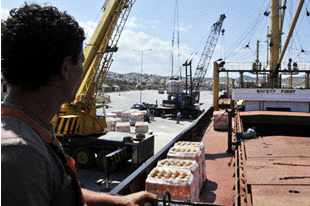 They suffered nine years of economic sanctions and this caused huge problems for the Libyan economy. Also, there is nowhere on planet Earth that has escaped the monumental crisis of neo-liberal capitalism. It has impacted everywhere – even on post-revolutionary societies that have rejected “free market” capitalism. However, what we are saying is that severe economic injustice is not at the heart of this conflict. So then, what is? The battle that is being waged in Libya is fundamentally a battle between pan-African forces on the one hand, who are dedicated to the realization of Qaddafi’s vision of a united Africa, and reactionary racist Libyan Arab forces who reject Qaddafi’s vision of Libya as part of a united Africa and want to ally themselves instead with the EU and look toward Europe and the Arab world for Libya’s future. 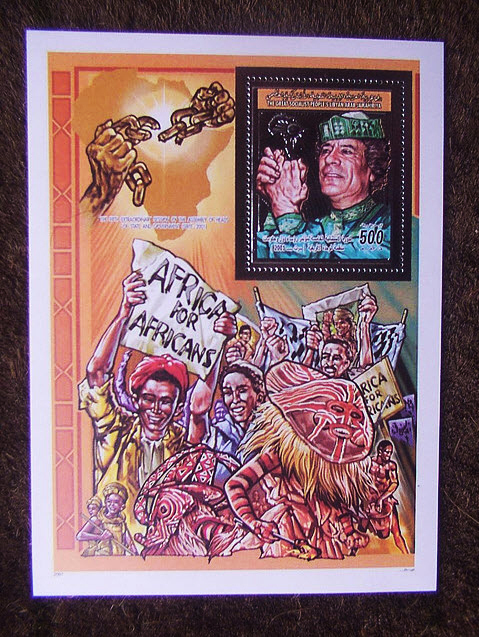 One of Muammar Qaddafi’s most controversial and difficult moves in the eyes of many Libyans was his championing of Africa and his determined drive to unite Africa with one currency, one army and a shared vision regarding the true independence and liberation of the entire continent. He has contributed large amounts of his time and energy and large sums of money to this project and like Kwame Nkrumah, he has paid a high price. Many of the Libyan people did not approve of this move. They wanted their leader to look towards Europe. Of course, Libya has extensive investments and commercial ties with Europe, but the Libyans know that Qaddafi’s heart is in Africa. Many years ago, Qaddafi told a large gathering, which included Libyans and revolutionaries from many parts of the world, that the Black Africans were the true owners of Libya long before the Arab incursion into North Africa and that Libyans need to acknowledge and pay tribute to their ancient African roots. He ended by saying, as is proclaimed in his Green Book, that “the Black race shall prevail throughout the world.” This is not what many Libyans wanted to hear. As with all fair skinned Arabs, prejudice against Black Africans is endemic. 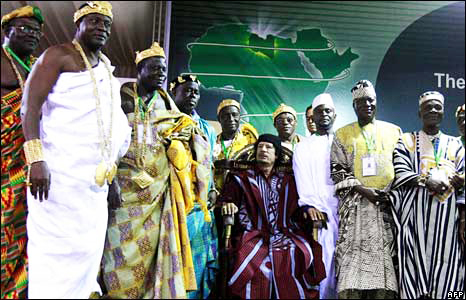 Brother Leader, Guide of the Revolution and King of Kings are some of the titles that have been bestowed on Qaddafi by Africans. 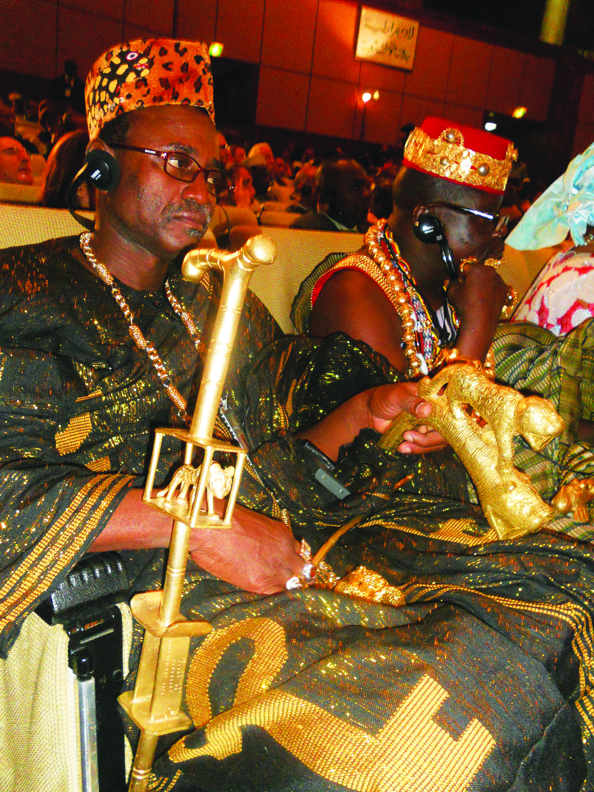 Only last month Qaddafi called for the creation of a Secretariat of traditional African Chiefs and Kings, with whom he has excellent ties, to co-ordinate efforts to build African unity at the grassroots level throughout the continent, a bottom-up approach, as opposed to trying to build unity at the government/state level, an approach which has failed the African unification project since the days of Kwame Nkrumah and Sekou Toure. 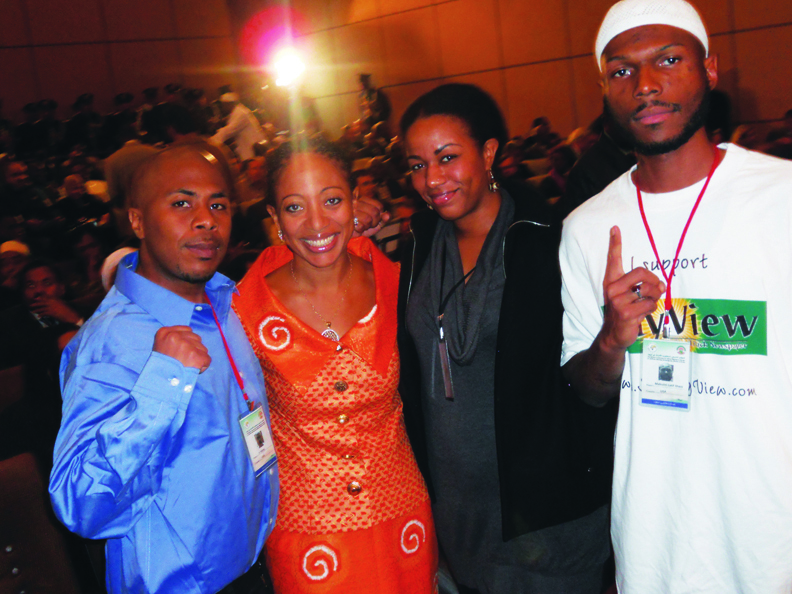 This bottom-up approach is widely supported by many pan-Africanists worldwide. Over the past two decades, thousands of Africans from all over the continent were provided with education, work and military training – many of them coming from liberation movements. As a result of Libya’s support for liberation movements throughout Africa and the world, international battalions were formed. These battalions saw themselves as a part of the Libyan revolution and took it upon themselves to defend the revolution against attacks from within its borders or outside. 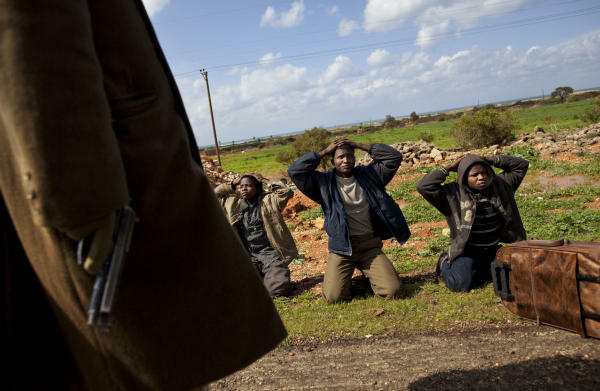 These are the Africans who are fighting to defend Qaddafi and the gains of the Libyan revolution to their death if need be. It is not unlike what happened when internationalist battalions came to the aid of the revolutionary forces against Franco’s fascist forces in Spain. As African fighters from Chad, Niger, Mali, Ghana, Kenya and Southern Sudan (it should be noted that Libya supported the Sudanese People’s Liberation Army under John Garang in their war of liberation against Arab hegemonists in Khartoum, while all other Arab leaders backed the Khartoum regime) fight to defend this African revolution, a million African refugees and thousands of African migrant workers stand the risk of being murdered as a result of their perceived support for Qaddafi. This is a far cry from what is being portrayed in the media as ‘peaceful protesters’ being set upon by pro-Qaddafi forces. In fact, footage of the Benghazi revolt shows men with machetes, AK 47s and RPGs. In the Green Book, Qaddafi argues for the transfer of all power, wealth and arms directly into the hands of the people themselves. No one can deny that the Libyan populace is heavily armed. This is part of Qaddafi’s philosophy of arms not being monopolised by any section of the society, including the armed forces. It must be said that it is not usual practice for tyrants and dictators to arm their population. Qaddafi has also been very vocal regarding the plight of Africans who migrate to Europe, where they are met with racism, more poverty, violence at the hands of extreme right wing groups and, in many cases, death when the un-seaworthy boats they travel in sink. “We should live in Europe with decency and dignity,” Qaddafi told participants. “We need a good relationship with Europe, not a relationship of master and slave. There should be a strong relationship between Africa and Europe. Our presence should be strong, tangible and good. It’s up to you as the Africans in the Diaspora. We have to continue more and more until the unity of Africa is achieved. Joint committees of African migrants, the United Nations, the African Union, the European Union and international organizations present at the conference discussed the need to coordinate the implementation of many of the conference’s recommendations. 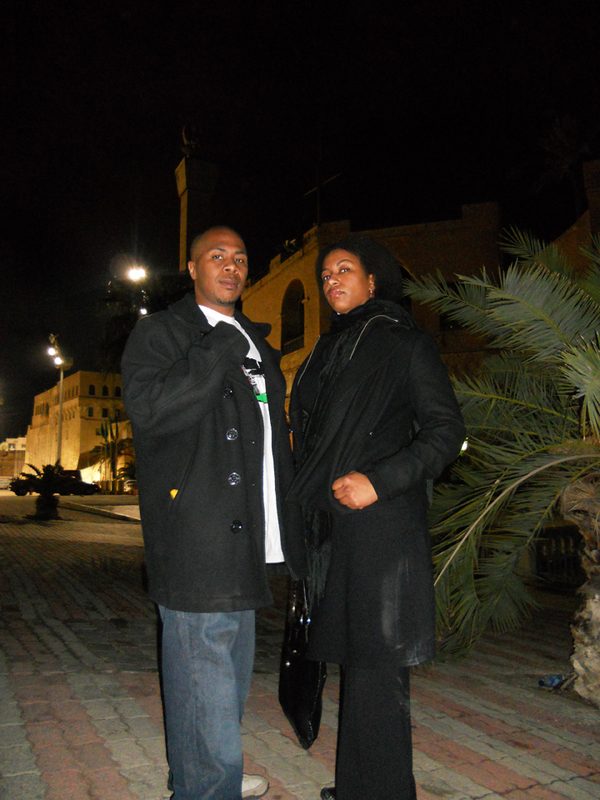 This counter-revolutionary revolt caught everyone, including the Libyan authorities, by surprise. They knew what the media is not reporting: that unlike Egypt and Tunisia and other countries in the region, where there is tremendous poverty, unemployment and repressive pro-Western regimes, the Libyan dynamic was entirely different. However, an array of opportunistic forces, ranging from so-called Islamists, Arab supremacists, including some of those who have recently defected from Qaddafi’s inner circle, have used the events in neighbouring countries as a pretext to stage a coup and to advance their own agenda for the Libyan nation. Many of these former officials were the authors of and covertly fuelled the anti-African pogrom in Libya a few years ago when many Africans lost their lives in street battles between Africans and Arab Libyans. This was a deliberate attempt to embarrass Qaddafi and to undermine his efforts in Africa. Qaddafi has long been a thorn in the Islamists’ side. In his recent address to the Libyan people, broadcast from the ruins of the Bab al-Azizia compound bombed by Reagan in 1986, he asked the “bearded ones” in Benghazi and Jabal al Akhdar where they were when Reagan bombed his compound in Tripoli, killing hundreds of Libyans, including his daughter. He said they were hiding in their homes applauding the U.S. and he vowed that he would never allow the country to be returned to the grip of them and their colonial masters. Al Qaeda is in the Sahara on his borders and the International Union of Muslim Scholars is calling for him to be tried in a court. One asks why are they calling for Qaddafi’s blood? Why not Mubarak, who closed the Rafah Border Crossing while the Israelis slaughtered the Palestinians in Gaza. Why not Bush, Cheney, Rumsfeld and Blair, who are responsible for the murder of millions of Muslims in Iraq and Afghanistan? The answer is simple – because Qaddafi committed some “cardinal sins.” He dared to challenge their reactionary and feudal notions of Islam. He has upheld the idea that every Muslim is a ruler (Caliph) and does not need the Ulema to interpret the Quran for them. He has questioned the Islam of the Muslim Brotherhood and Al Qaeda from a Quranic/theological perspective and is one of the few political leaders equipped to do so. Qaddafi has been called a Mujaddid (this term refers to a person who appears to revive Islam and to purge it of alien elements, restoring it to its authentic form) and he comes in the tradition of Jamaludeen Afghani and the late Iranian revolutionary, Ali Shariati. 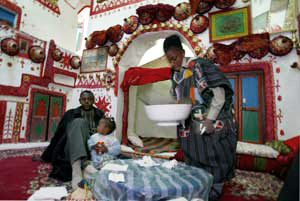 Libya is a deeply traditional society, plagued with some outmoded and bankrupt ideas that continue to surface to this day. In many ways, Qaddafi has had to struggle against the same reactionary aspects of Arab culture and tradition that the holy prophet Muhammad (pbuh) was struggling against in seventh century Arabia – Arab supremacy/racism, supremacy of family and tribe, historical feuding tribe against tribe and the marginalisation of women. Benghazi has always been at the heart of counter-revolution in Libya, fostering reactionary Islamic movements such as the Wahhabis and Salafists. It is these people who founded the Libyan Islamic Fighting Group based in Benghazi which allies itself with Al Qaeda and who have, over the years, been responsible for the assassination of leading members of the Libyan revolutionary committees. These forces hate Qaddafi’s revolutionary reading of the Quran. They foster an Islam concerned with outward trappings and mere religiosity, in the form of rituals, which at the same time is feudal and repressive, while rejecting the liberatory spirituality of Islam. While these so-called Islamists are opposed to Western occupation of Muslim lands, they have no concrete programmatic platform for meaningful socio-economic and political transformation to advance their societies beyond semi-feudal and capitalist systems which reinforce the most backward and reactionary ideas and traditions. Qaddafi’s political philosophy, as outlined in the Green Book, rejects unfettered capitalism in all its manifestations, including the “state capitalism” of the former communist countries and the neo-liberal capitalist model that has been imposed at a global level. The idea that capitalism is not compatible with Islam and the Quran is not palatable to many Arabs and so-called Islamists because they hold onto the fallacious notion that business and trade is synonymous with capitalism. Whatever the mistakes made by Qaddafi and the Libyan revolution, its gains and its huge contribution to the struggle of oppressed peoples worldwide cannot and must not be ignored. Saif Qaddafi, when asked about the position of his father and family, said this battle is not about one man and his family; it is about Libya and the direction it will take. That direction has always been controversial. In 1982, The World Mathaba was established in Libya. Mathaba means a gathering place for people with a common purpose. The World Mathaba brought together revolutionaries and freedom fighters from every corner of the globe to share ideas and develop their revolutionary knowledge. The hideous notion being perpetuated by the media and reactionary forces, inside and outside of Libya, that this is just another story of a bloated dictatorship that has run its course is misinformation and deliberate distortion. Whatever one’s opinions of Qaddafi the man, no one can deny his invaluable contribution to human emancipation and the universal truths outlined in his Green Book. Progressive scholars in many parts of the world, including the West, have acclaimed The Green Book as an incisive critique of capitalism and the Western parliamentary model of multi-party democracy. In addition, there is no denying that the system of direct democracy posited by Qaddafi in The Green Book offers an alternative model and solution for Africa and the Third World, where multi-party so-called democracy has been a dismal failure, resulting in poverty, ethnic and tribal conflict and chaos. Let’s get it right: The battle in Libya is not about peaceful protestors versus an armed and hostile state. All sides are heavily armed and hostile. The battle being waged in Libya is essentially a battle between those who want to see a united and liberated Libya and Africa, free of neo-colonialism and neo-liberal capitalism and free to construct their own system of governance compatible with the African and Arab personalities and cultures, and those who find this entire notion repugnant. And both sides are willing to pay the ultimate price to defend their positions. Make no mistake, if Qaddafi and the Libyan revolution are defeated by this opportunistic conglomerate of reactionaries and racists, then progressive forces worldwide and the pan-African project will suffer a huge defeat and setback. Gerald A. Perreira has lived in Libya for many years and was an executive member of the World Mathaba. He can be reached at mojadi94@gmail.com. This story has previously appeared on Black Agenda Report and many other sites. “A Decent Life in Europe or a Welcome Return to Africa"
"not one pro-Qaddafi voice has been allowed to air." Yet, AJE has aired all the speeches of the Colonel and his son… they even interviewed his son. At least those PR firms got paid. You did it for sucker prices. You know, sure Momar did good things for African unity. No one is denying that. He also gunned down protesters in the street and still is. I think he is a military ruler who gets a free ride from the "left" just because he is against American imperialism. Listen to the speeches he has given recently. Listen to the reasonable voices of dissent that are speaking out. Listen to Al Jazeera, listen to KPFA or Democracy now. I really dont think of these as amerikkan corporate media spreading racist lies. I disagree explicitly with the defense of Momar and think people run the risk of seriously losing credibility and weakening the actual resistance to imperialism by supporting his regime. Its like some socialists who supported the crackdown against the student protesters in Tianamen square. I believe it is wrong. I support PNN and Bayview newspaper, but I dont support Momar and don't think it is just Islamist activists or Neo Liberal opportunists. It is considerably more complex. Just because he wrote the green book and stood up against the US doesn't mean he is correct in this situation. Call a hero a hero but call a killer a killer. It is true the US has its eyes on the oil there, but students have their eyes on being able to speak their mind and be represented without being persecuted as well. You guys cant always be right (even if you usually are)!